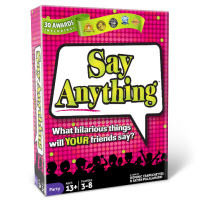 Say Anything is a game similar to Apple to Apples but instead of choosing from a select number of choices for your answers, you can literally say anything. How many times did you wish you had a specific card that would definitely score you a point? Now you can just write down your answer any time you'd like. The interesting aspect of the game Say Anything is you can win points by being serious, funny or playing to what you think each person will pick. It is a lot of fun seeing the different and creative answers that people come up with. The best thing about Say Anything is you can quickly explain the game rules in about 5 minutes and almost all ages can play. Be the player with the most points after 12 rounds and you'll be pronounced the winner. You'll get 80 cards with 400 questions, 8 dry-erase pens and boards, 1 select-o-matic, 16 player tokens, a score board and the official Say Anything game rules and instructions. Please keep in mind that the official Say Anything party rules and instructions could be different depending on the game version you have. The rules below are some of the exact directions on how to play Say Anything. Share with us your comments, funny stories, tips, advice, strategies, creative ways to play, questions about how to play, problems with the rules or anything you want about Say Anything. All submissions will be reviewed within 24 hours. Click here to add your Say Anything comments. My son got this as a present and it is the new family favorite. The rules are so easy my 4 year old daughter thinks it's fun to play with the family (although she has some interesting answers at times making it even more funny). Great game to play with adults and children. They get to play and throw an interesting twist on the game. You never know what answers you're going to get and you can customize the answers for the moment. A lot of fun.